How much do you know about your computer? Even if you're a power user, chances are you know less than you think. Most geeks can break down the basics--CPU, RAM, video card, OS, etc. but the deeper you go, the harder the questions are to answer. What are your current memory timings? What extended instructions does your CPU support? What's the product ID for your motherboard? Instead of reaching for the manual, booting into BIOS, or interrogating Google for the details, there's another answer: Finalwire's AIDA64 Extreme Edition. AIDA64's stress test is worth its weight in gold. 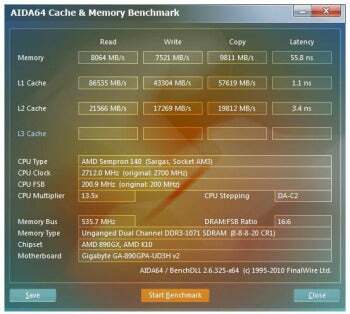 Now in its third incarnation after nearly a decade of development, AIDA64 is comprehensive system information and benchmarking suite designed to lay bare every conceivable aspect of your computer. Multiple versions cater to different markets; the initial 30 day trial version of each can be unlocked into either Extreme ($40) or Business ($80/5 nodes) editions. Extreme focuses on enthusiasts and performance computing while Business provides IT network inventory functions and can scan several systems at once. We took a look at the Extreme edition for this review. AIDA64 Extreme is presented Microsoft Management Console-style, with a single window containing two panes of nested commands and data. The left pane lists the available tools and the right pane displays the results of each query or operation. Most of these are informational, breaking down each of your computer's subsystems by hardware component or software module and allowing you to drill down to details you never imagined were readily accessible, such as your DIMMs’ serial numbers or how many reboots you've performed since your desktop went live. Beyond the audit, several benchmarking tools provide data on CPU, hard disk and memory performance. AIDA64 ranks and compares results against a comprehensive database of other systems past and present giving you context for your results. While the memory tests are well regarded by enthusiasts, the real gem here is a flexible system stability tool that allows users to stress test main components in any combination desired while tracking system temperatures, voltages and fan speeds via graphs that are updated in real time. Overclockers will find this indispensable, as few tools combine these features. Problems are few but noteworthy. First, there's no way to measure 3D performance, a curious omission given the otherwise comprehensive nature of the suite. Price is the second factor. With no free version beyond the 30-day trial license, $40 is the minimum buy-in for AIDA64. SiSoft's Sandra, a similar system information and benchmarking suite, has a free version with many of the features found here, although it lacks the stress tests. This price may hurt AIDA64's appeal, but it doesn't take away from its utility or unique function. Take the trial out for a spin. The stress tests may be worth the price alone for hardware enthusiasts.